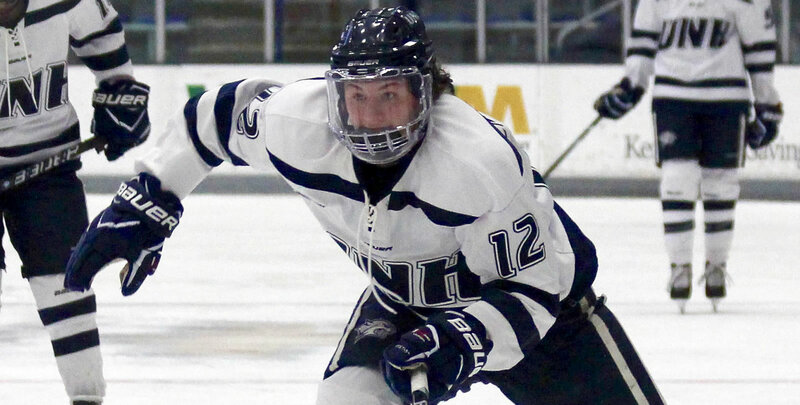 DURHAM, N.H. - Senior forward Devan Taylor (North Billerica, Mass.) tallied her third goal of the season, to give the University of New Hampshire women's ice hockey team a 3-2 victory over the Merrimack Warriors Friday night at the Whittemore Center. A game that saw three UNH leads and two ties, the Wildcats it came down to Taylor's power play goal in the third period to give the 'Cats their second win in a row, and their fourth straight game without a loss (3-0-1). All three of the Wildcats' goals came on the power play, with the first two being scored by freshman Lauren Martin (Cambridge, Ontario) and junior Taylor Wenczkowski (Rochester, N.H.). Senior captain Kyra Smith (Littleton, Colo.) stopped 35 saves and kept the Warriors from getting a lead at all in the game; her record on the season is now 3-4-1. The Wildcats travel to North Andover, Mass. on Saturday for game two of this series at Merrimack. The 'Cats then face a pair of ECAC foes, starting with Dartmouth on Tuesday, December 4. They return home next Saturday, December 8 for their last game of the semester, hosting Harvard at the Whittemore Center at 2 P.M. Tickets for that game are available online at UNHWildcats.com or by calling (603) 862-4000. - The Wildcats struck first 7:14 into the first period on a power play attempt that was originally shot by Taylor Wenczkowski, but the initial shot was saved and bounced into the crease where Lauren Martin poked it home with ease. - Merrimack would answer 11:52 into the period on an even strength 2-on-2 break; the puck was shot by Merrimack's Mikyla Grant-Mentis and was initially saved by Kyra Smith, but Paige Voight crashing the net had the puck bounce off her skate and into the net to tie the game at 1-all. - The score was tied throughout the second period until another power play goal by the Wildcats, this one a shot from the point by Wenczkowski that found its way through the defense and caught Ridgewell out of position, beating her stick-side. Defenders Tori Howran (Bancroft, Ontario) and Marie-Jo Pelletier (Dalhousie, New Brunswick) assisted on the play. - Another power play for the Wildcats had UNH looking to put the game out of reach, but a two-on-one from Merrimack's Katelyn Rae and Mikyla Grant-Mentis was able to tie the game up once again. The short-handed goal came 2:23 into the third period. - On that same power play just 48 seconds later, Nicole Dunbar (Coto de Caza, Calif.) passed into the crease from the far left corner, hitting the stick of Paige Rynne (Ancaster, Ontario) and deflecting the puck over to Devan Taylor. Taylor waited for an opening, and shot the puck off the mask of Ridgewell and into the net for the eventual game-winning goal. - Merrimack pulled their goaltender with 1:21 remaining on the third, but the Wildcats were able to close off the Warrior forwards from getting many clean shots off, and the ones that did were taken away by Smith. - The Wildcats tallied three power play goals in the contest; the last time they had that many power play goals in a game was a 4-1 victory over UConn in February of 2017. - Martin's goal was her second career goal and her second in as many games. - With two assists, Marie-Jo Pelletier now has two multi-assist games in her career and six multi-point games. - Wenczkowski is now on a two-game point streak with one goal and three assists for four points. Her two points in the win is her second straight multi-point game, and the sixth of her career. - Four Wildcat players are now tied for a team-high eight points: Taylor Wenczkowski, Nicole Dunbar, Tori Howran, and Carlee Turner (Scottsdale, Ariz.). - The Wildcats have won two games in a row for the first time all season.